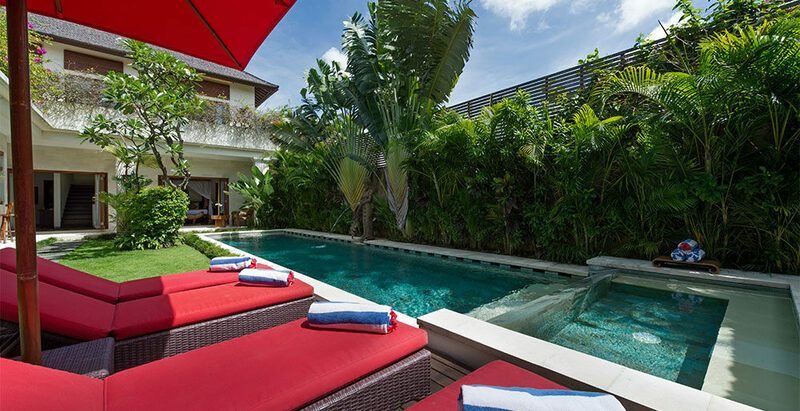 Villa Kalimaya, group of villas is a collection of exclusive, one of the parts of Villa Kalimaya is Villa Kalimaya Two, fully staffed luxury villas conveniently located in the heart Seminyak, the best and most convenient location Bali has to offer. Tucked away in the sanctuary of a small, quiet Gang (lane), all four of the beautifully appointed individual private villas are just meters away from the best beaches and hippest bars like Kudeta, Potato Head, W Hotel and within a short walking distance from the ultra-chic shopping district of Seminyak. 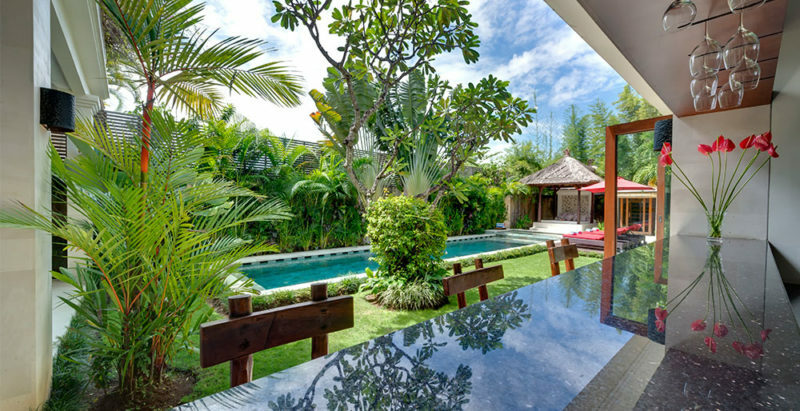 Villa Kalimaya Two is beautiful two-bedroom private pool villa, which sit side-by-side within the Kalimaya family of villas. The two-storey air-conditioned residences are mirror images with Kalimaya Three in terms of their layout, yet each has it’s own personality and sense of style. 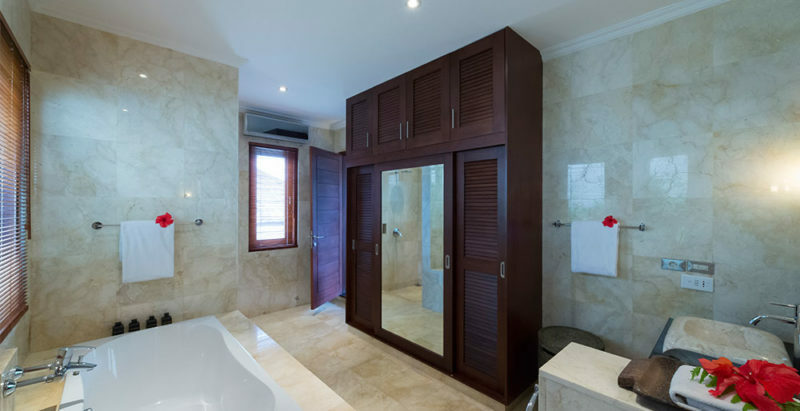 Both are lovingly furnished and feature double bedrooms with marble ensuite bathrooms, fully equipped open-plan kitchens, living rooms on both floors, private swimming pools and infrared saunas. 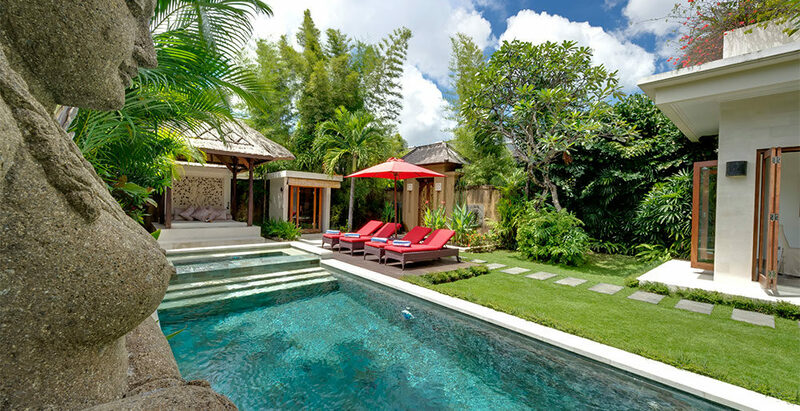 Villa Kalimaya Two is set within lush tropical garden, where traditional thatched balés overlooking the sparkling pool make the ideal spot to relax. 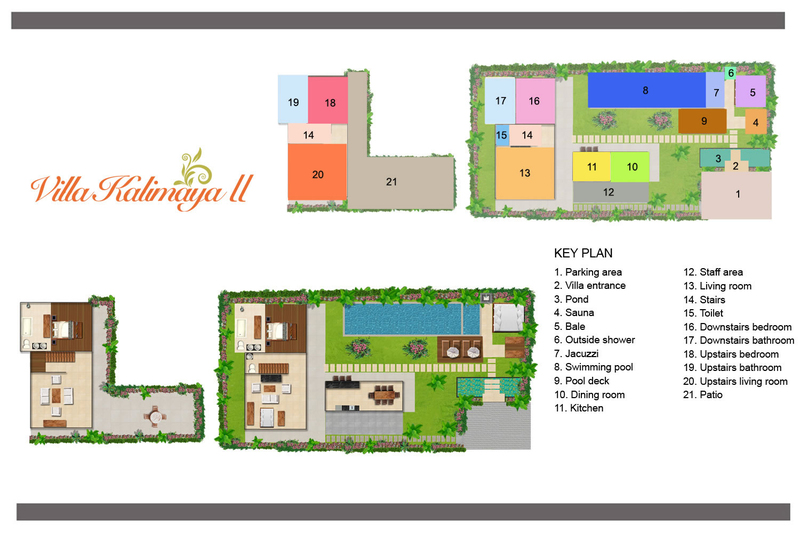 Located at strategic area, Kalimaya Two is just walking distance to the beaches and Seminyak Shopping centre. 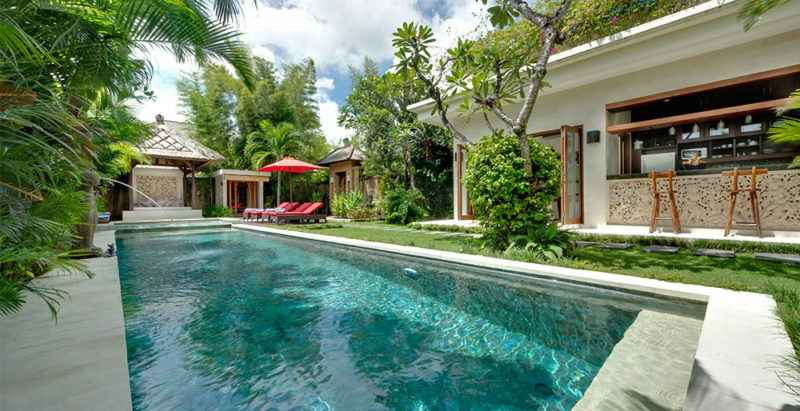 All Villa Kalimaya, group of villas offer 24 hours security for your safety and peace of mind. 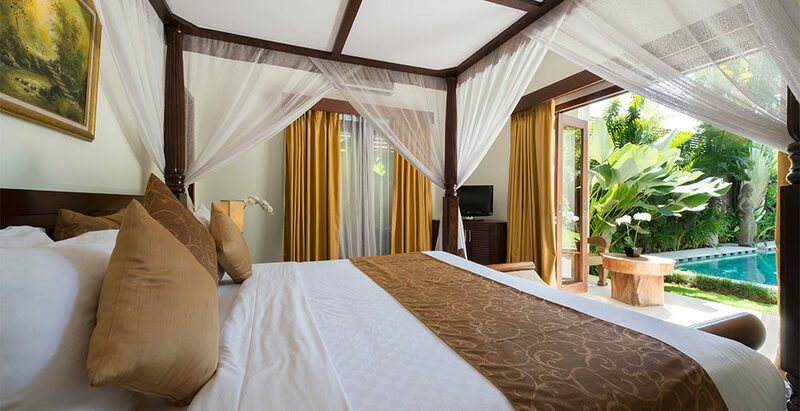 Villa Kalimaya Two has two beautiful air-conditioned bedrooms featuring luxurious four-poster beds. 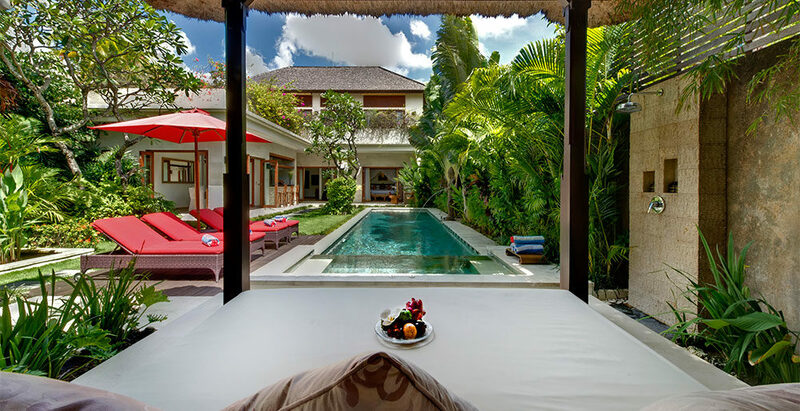 The downstairs room has full-length glass doors that can be opened up to access the tropical garden and pool area, whilst the upstairs room opens onto a balcony, giving it a wonderful sense of light and space. 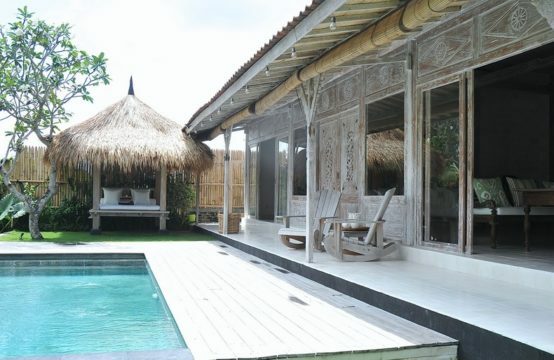 Both bedrooms are equipped with a TV and DVD player, and the upstairs room is fitted with an iPod dock and bar fridge. 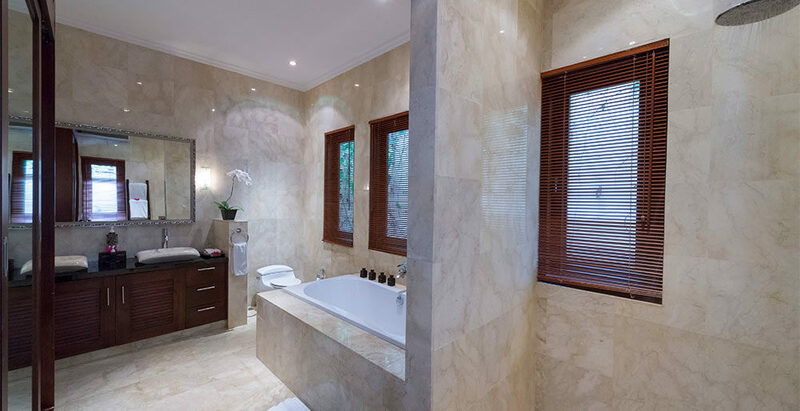 Each bedroom has an adjoining marble ensuite, which features a large bathtub and rain shower. 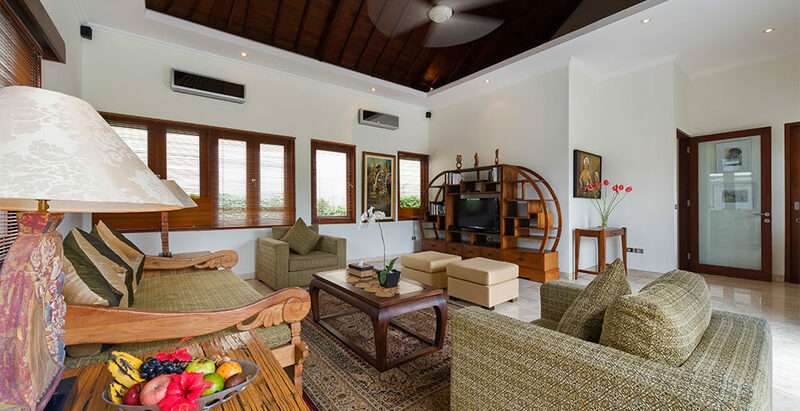 Villa Kalimaya Two boasts three fantastic indoor living spaces, including ground- and first-floor lounges which can be opened to embrace the warm tropical breezes or closed for absolute air conditioned comfort. 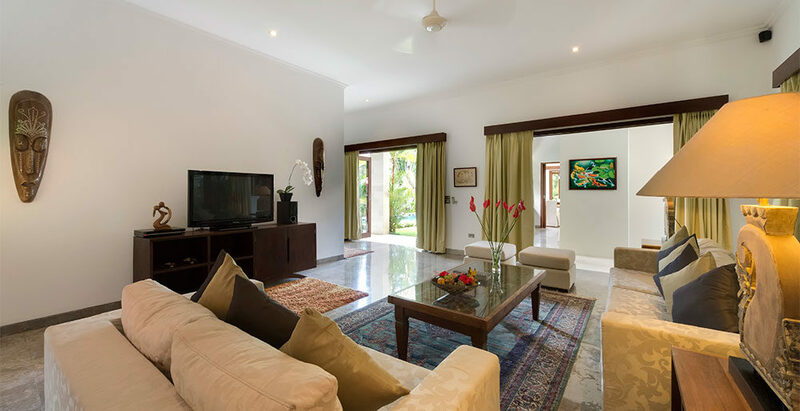 Lounges are equipped with satellite TVs and DVD players and with the added bonus of having spectacular surround-sound, these rooms can become your very own home cinema. 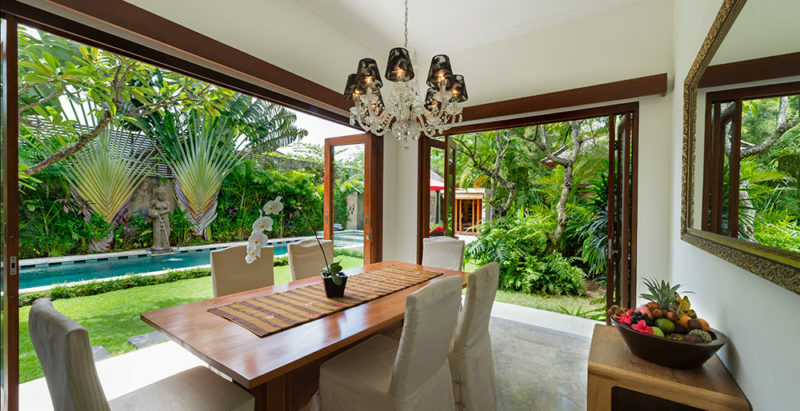 The dining room, which directly overlooks the garden and pool, can also be opened for indoor—outdoor ambiance or closed for comfortable, temperature-controlled dining. Grab an icy-cold beer and enjoy a chat at the kitchen bar overlooking the pool or settle in for cocktails followed by a meal on the upstairs balcony, surrounded by vibrant bougainvillea, and watch the sun set on a perfect Balinese evening. In the private walled garden palm trees and aromatic frangipanis flourish. 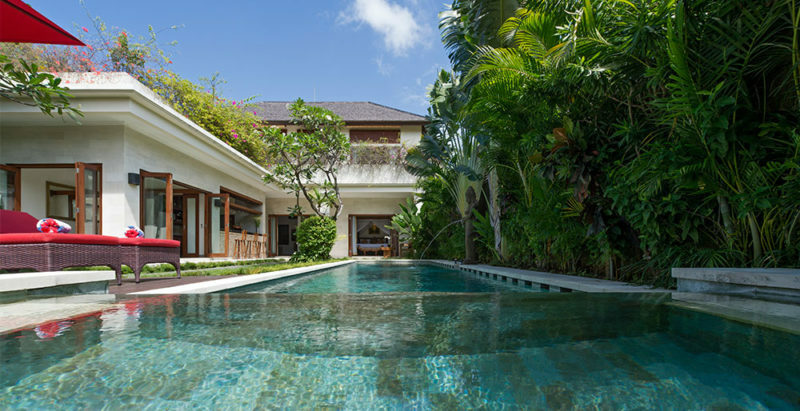 The glistening swimming pool, bordered by a deck furnished with lounge chairs and umbrellas, forms the centerpiece of the villa. 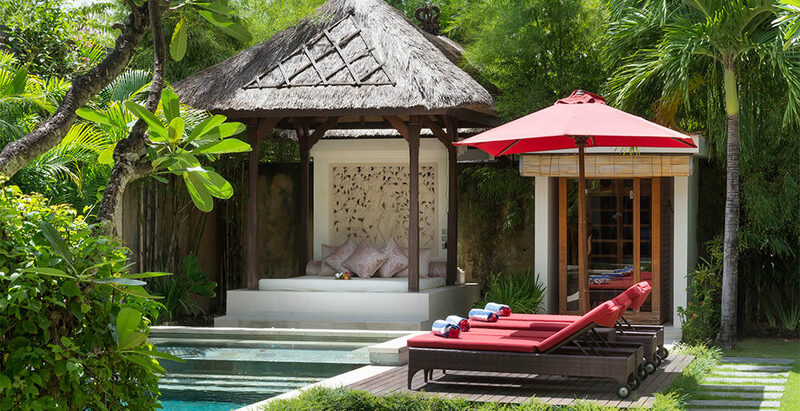 The covered balé at the end of the pool is an ideal spot to relax and rejuvenate and can also be used for a traditional Balinese massage. For the health conscious, there’s an infrared sauna to boost your well-being. 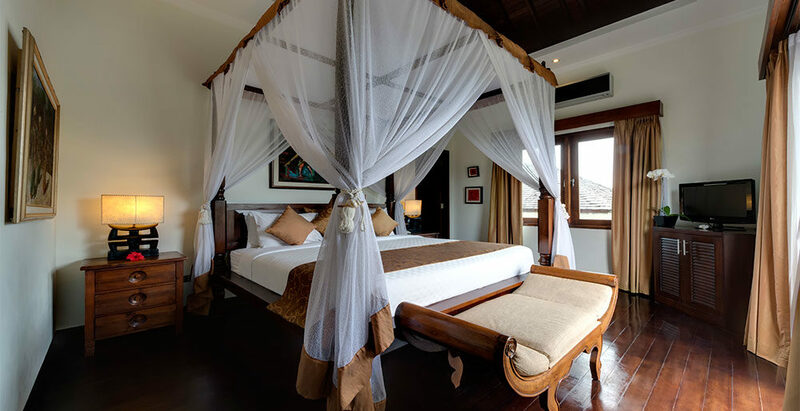 Four people (two king-size bedrooms). Additional beds available(at an extra charge). iPod docking station in lounge area; one plasma TV (in each bedroom and living area); one DVD player (in each bedroom and living area); a selection of movies; books; Bose surround-sound system. 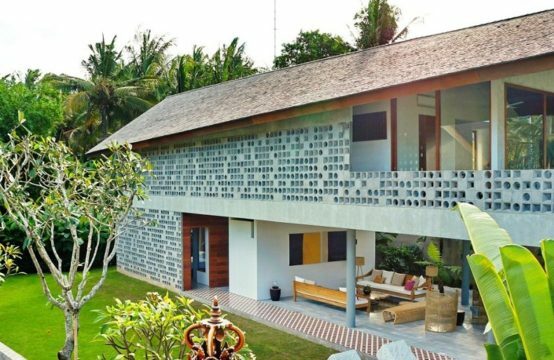 Villa Kalimaya II is well equipped for families. Facilities include high chairs; baby cots and children’s DVDs. Infra-red sauna; full back-up diesel powered electrical generator.